In celebration of the 55th anniversary of the Porsche Club of America (PCA), TAG Heuer has created a limited edition Monaco timepiece to commemorate the milestone. 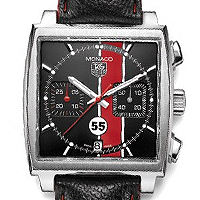 In staying with the 55 theme, the timepiece will be limited to just 55 pieces, it will display the racing number “55″ on the black and red dial, and it will retail for just $5,500. Its no surprising that these two companies have joined together for such a collaboration, as they have a long history together starting back in 1969, when the watch company pledged its support to Jo Siffert, the Swiss racecar legend. The limited edition timepiece has a stainless steel case that measures 41 millimeters wide by 12 millimeters thick. The black and red striped dial is protected by a plexiglas crystal and displays hours, minutes, seconds, date and chronograph which displays time measurement in 30 minutes and 60 seconds. The watch features a black leather strap black decorated with red stitches and racing holes. The watch will be powered by an automatic movement and will provide a water resistance of up to 30 meters. Delivery for the watch is expected to be in September of this year. TAG Heuer is marking its 150th anniversary in 2010 with its re-edition the famous Silverstone Chronograph. One of the most coveted collector's TAG Heuer watches, the original Silverstone chronograph was introduced way back in 1974. 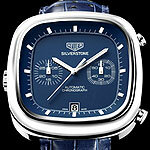 Known for its cushion cut-shaped case, a shape chosen to resemble the Silverstone Circuit, a famous English racing track. The Silvertone Chronograph is similar in design to its predecessor, the Monaco who's square shaped case helped inspire the brands patented water-proofing system. Both the original Monaco and Silverstone featured the Chronomatic Calibre 11, a revolutionary movement that was the first movement that was a self-winding automatic chronograph with micro rotor. The re-introduced version of the TAG Heuer Silverstone watch features an updated version of the Calibre 11, incorporating Dubois-Depraz module. The watch has a throwback to the brand's original Heuer logo displayed on the dial. The dial itself is available in blue or brown and has two silver counters at the 3 and 9 o'clock positions. The date can be viewed with the hand-applied date window at 6 o'clock. The watch has two stainless steel pushbuttons at the 2 and 4 o'clock positions. The watch is completed by a perforated alligator leather strap in brown or blue. 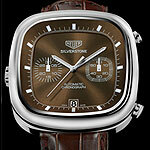 TAG Heuer Silverstone is a limited and numbered edition of 1,500 pieces or each color. 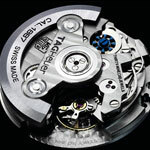 To commemorate 150th anniversary of the brand, TAG Heuer has unveiled the in-house chronograph Caliber 1887 movement. This new movement, which took almost four years and 20 million Swiss Francs to complete is comprised of a multitude of individual parts and incorporates a conventional column wheel system. The number of the calibre was chosen to signify the year when the watchmaker invented an oscillating pinion, a groundbreaking development for chronograph mechanisms. The caliber 1887 is an automatic chronograph movement which is equipped with a mainspring barrel, which is recharged through a skeletonized centrally positioned rotor. When it has been fully-wound the mechanism has a power reserve of about 40-50 hours. The glucydur balance wheel beats at the rate of 28,800 vibrations per hour. The total dimensions for the Tag Heuer Caliber 1887 movement are 7.1mm high by 29.3mm in diameter. 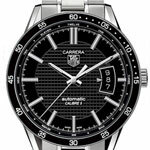 Just in time for the back to school rush Tag Heuer is releasing a brand new Carrera Calibre 5. 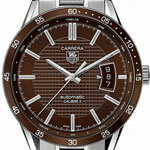 The Carrera Calibre 5 Watch wll be available in two variations one with a black dial and one with a brown dial. I personally like the brown dial, which does not happen very often as I prefer black to brown, but this watch seems to be complimented well by it. The dial of the new Carrera watch has a Clous De Paris pattern and an alphabetical time scale flange. The dial allows for great readability, even under reduced light conditions as it has hand-applied hour markers and polished baton-shaped hands coated with luminescent material. Its date display can be found at 3 o’clock position. 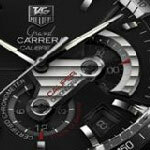 The standard “Carrera” and TAG Heuer logo are at 12 o’clock position. The face of the watch is protected by a scratch-resistant sapphire crystal. The polished stainless steel case measures in at 39 millimeters in diameter and it incorporates either a black or brown aluminum bezel. 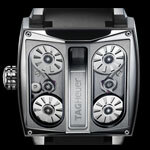 Its see-through case-back is constructed from sapphire crystal which reveals the TAG Heuer Calibre 5 automatic movement. This popular and reliable movement has the advantage of a 42-hour power-reserve. The excellent case construction allows for a 100-meter water-resistant. The TAG Heuer Carrera Calibre 5 watch completed by a 5-row stainless steel bracelet which has contrasting brushed and polished finishing which is kept securly on the wrist with its polished folding clasp with safety push buttons. 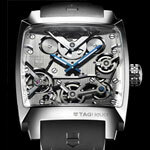 TAG Heuer has been developing this timepiece for years, it was first introduced at Baselworld in 2004 as just a concept. After 3 more years of development in 2007 the brand presented its pre-series prototypes. Well the journey is about to be complete and this one time concept timepiece is now becoming reality with an expectation to be available for sale by the last quarter of this year. While it is not uncommon for luxury watches to be inspired by luxury cars, the Monaco V4 watch found its inspiration from the car engines. Which should make for an easy transition as car engines and mechanical watches have similar concerns in regard to performance. 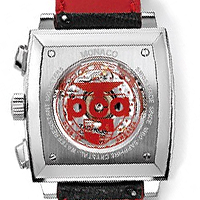 The TAG Heuer Monaco V4 is unique in many respects, instead of a rotating oscillating weight for automatic winding they have substituted a 4.25-gram platinum ingot which is used as a kind of cylinder, in a linear movement. One of the most car engine like developments is the drive-belt transmission of power. This includes 13 notched belts with a gauge measuring 0.5 x 0.45mm. The movement has 2.2mm diameter bearings with 0.25mm balls that rotate inside, instead of synthetic rubies often used for reduced friction. It also includes four barrels that serve as energy generators and feature transparent sapphire bridges. Each single barrel produces energy of 375 grams which results in a total output of 1.5 kilos. 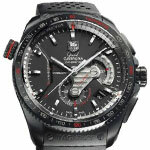 The Grand CARRERA Calibre 36 RS was first revealed by Tag Heuer at last years BaselWorld as their Concept Watch of the year. The Calibre 36 RS went on to win several awards including an award in the Sports category at the Grand Prix d’Horlogerie de Genève in November 2008. This impressive concept watch is the first to feature an mechanical automatic chronograph capable of measuring and displaying 1/10ths of a second. The watch has a stunning black titanium case with a carbide coating and has beautiful "black gold" accents on the dial. The first Grand Carrera was launched in 2007 and had the first mechanical line of movements with Rotating System. This new feature enabled the user to easily read the small seconds, second time zone, or chronograph time by displaying the elapsed time. The Grand Carrera Calibre 36 RS enhances this feature by magnifying it by 10 times. The COSC-certified chronometer movement beats at the frequency of 36, 000 vibrations per hour and has 2 Rotating Systems indicating the chronograph minutes at 3 o'clock and chronograph hours at 6 o'clock. There is also a Linear permanent second at 9 o'clock and a date display. The black titanium case measures 43 mm in diameter and has an oversize titanium carbide coated crown with red line at 10 o'clock allowing to use the Rotating Scale. The watch has titanium carbide coated push buttons, screw-in crown, and bezel which has been fine-brushed and polished - displaying a tachymeter scale. The dial is protected by a double antireflective curved sapphire crystal, and the case back has a smoked double sapphire case back which allows you to view the unique mechanism. The black dial displays "black gold" Chronograph minute at 3 o'clock, and Chronograph hour at 6 o'clock. The curved faceted "black gold" indexes and TAG Heuer logo have been hand applied. 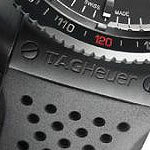 The watch is completed by a black rubber strap with a titanium carbide coated end piece and a titanium carbide coated folding clasp with safety push buttons and applied TAG Heuer logo.